This filly is not for sale. 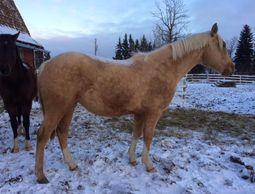 Tala is sired by a 5 panel N/N Stallion. Her dam's 5 panel testing is pending. We got Tala out for some halter in 2017 and she picked up some APHA PAC points in halter. We plan to show her again in the coming show season in halter/showmanship.